Where is the Capital of Louisiana? The Map of Louisiana (LA) shows the location of the state capital in the "Pelican State". 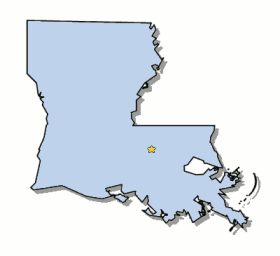 Louisiana has 64 counties, and the capital of the State is Baton Rouge. On a map, the capital city is always indicated by a star. Interesting fun facts about Baton Rouge including its history, location, county, current population, size of the city and the nickname of Baton Rouge, Louisiana. The Map of Louisiana and map provides an outline of the state, which covers 51,843 square miles. 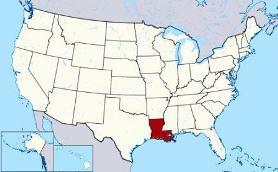 The size of the state's capital city, Baton Rouge, is 79.11 square miles. Test your recognition skills of the map of the state, and knowledge of its capital, with our State Maps Quiz Game. The location of Baton Rouge is in the south eastern part of the state along the Mississippi River. The city is located in East Baton Rouge Parish, Louisiana. Each of the 50 states have their own capital city. The city of Baton Rouge is the capital of the state. The capital does not have to be the largest city in the state, but is usually centrally located either geographically or by population. Fact 3: The population of the capital city of Baton Rouge is 230,058. Nickname "Big Raggedy"
Fact 5: History - Baton Rouge was established as a military post by the French in 1719. Fact 6: History - The town was inhabited by French speaking settlers exiled from Acadia. Fact 7: History - The name of the city derives from a red cypress tree that marked the boundary between the Houma and Bayou Goula tribal hunting grounds. The French called the tree "le baton rouge," meaning the red stick or red staff. Fact 8: History - The city was incorporated in 1817 and became Louisiana's state capital in 1849. Many large sugar plantations give the area a name as "The Sugar Bowl of America." Fact 9: History - During the Civil War (1861-1865) war, the state capital of Louisiana was moved to Shreveport and eventually returned to Baton Rouge in 1880. Fact 10: Baton Rouge, Louisiana has one of the largest ports in the country. The number of people, or the population of the capital city of Baton Rouge, obviously changes constantly but the government statistics for the 2012 population of Baton Rouge was 230,058, which provides a good indication of the number of inhabitants of the city. We hope that the interesting facts and information about Baton Rouge will help kids and school children with their homework. Learn more by playing the States and Capitals Game. Baton Rouge Nickname "Big Raggedy"